The other day I was listening to the radio when the most beautiful rendition of Amazing Grace came on. It was sung by a choir of children. As their angelic voices rang, I paused from cleaning the kitchen. 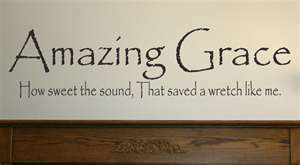 I listened to them sing, “Amazing grace how sweet the sound, that saved a child like me…” Being that I have heard this song sung my entire life, this stood out because the original version of the song says, “that saved a wretch like me.” As I asked myself why they changed the words, I already knew the answer. We cannot have children calling themselves wretches; it might hurt their self-esteem. In an effort to build up children, some people have stopped keeping score during sports activities. The reasoning is that if one team loses they will develop poor self-esteem. Giving every child a trophy at the end of a sport’s season is along the same line of thinking. I have heard of teachers who do not give F’s anymore to students. They instead give U’s for unsatisfactory or I’s for incomplete. We don’t want a child to know they failed. When we placate to an already self-centered nature that is ingrained in all children, we foster in them a deeper selfish attitude. There is a lot of talk in even Christian circles about self-esteem. For example, Christian’s are terrified to point out sin in a brother’s life. Even though the Bible clearly says that we are to admonish one another. The justification for this is that we might hurt their feelings. We might make them feel bad. We might crush their self image. But consider for a moment exactly what we are saying when our only concern is “self-esteem”. We are saying that we should esteem self. We must build people up in that we don’t damage their ego. However, when we build up ego, we essentially Edge God Out. In all of our concern with self has anyone stopped to consider how God feels in it all? Can I suggest that this is the problem with our society? We are too concerned with “self”. For the last few generations people have not been taught correctly from the Word of God about the condition they are in prior to God’s grace. In an attempt to build up self we have become blind to the truths of Scripture about the state of mankind. “Well, we’re all just sinners”, many will say placing themselves in the same category as the rest of the world. But let me submit that it was not until I stopped looking at everyone else, focused upon my own life, and fully came to grasp with what a wretch I was, that I could I fully understand God’s amazing grace. Until I saw myself as filthy and undone could I accept the righteousness of Christ. Until I truly saw myself as lost and without hope could I become saved with complete assurance. Until I could cry out like the publican, “God be merciful to me a (the only one) sinner” or until I could say like Paul that I am the chiefest of all sinners did I truly understand my position before God. Until I repented and turned from my sins could I be made right. Until I realized that I was sick in sin could I be healed. “They that are whole have no need of the physician, but they that are sick: I came not to call the righteous, but sinners to repentance,” Mark 2:17. My children are precious and as a parent I naturally want to build up their self-esteem. But a building of self, while soothing to our sinful nature, is to their eternal detriment. The best gift I can give them is to show them how they stand before a Holy and Just God. It is when a child understands this and accepts God’s salvation then they have true worth, God’s grace is truly amazing, and their esteem is in Him alone! “It is better to trust in the LORD than to put confidence in man,” Psalm 118:8. Very well said, Kimberly. This IS what is wrong with our society. Grace is amazing!!! I have heard of many marriages end in divorce with the explanation that “no one was happy.” We think too highly of ourselves and not enough of God’s grace!